Guild War 2 | G.A.M.E. We are in the barren wastelands, that frigid mountain passes, and the verdant, rich valleys throughout the world of Tyria. 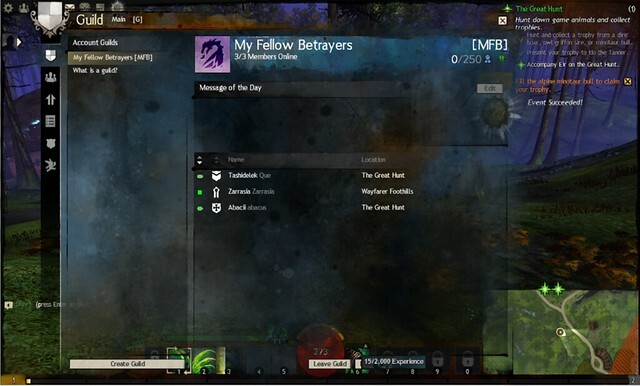 Here we have come to continue our exploration with the “Cognitive Betrayal” guild started by myself, Mellody Collier, with the support of my guildees from Inevitable Betrayal, on Devona’s Rest. Guild Wars 2 is a Massively Multiplayer Online Role-Playing Game. It is a sequel to Guild Wars and takes place 250 years later in the shattered world of Tyria. While Guild Wars 2 offers quests, it is unique in that it employs a “dynamic events” system that is constantly changing your gaming experience based on the actions of the players. Another unique aspect of GW2 is the personal story. Your choices determine how the game plays out for you. No two players will have exactly the same experiences. These concepts are carried over into the Dungeons with each dungeon being divided into story mode and explorable mode. For those that like the challenge of competitive play there is Player versus Player and World versus World. My Fellow Betrayers is founded on the same principles and created to further promote the same philosophies as its counterpart in World of Warcraft, Inevitable Betrayal.